so instead here’s a fairly innocuous/boring page that can be broken down into various stages of development. 5) final inks. This is page 298. And today I finished page 302. Thank you for waiting! PS — for those of you interested in production details, check my old tool talk posting. So amazing. Thank you for sharing with us! I *cannot* wait for this book! And second! Great work, Craig! You are always an inspiration. I love seeing work process’ on people’s blogs. The final page is wonderful. I’m a young french drawer and i wanted to say you that Blankets change my vision of drawing. And more than the draws, the way you tell us this part of your life touch me very profundly. Blankets is maybe my best comic book. it’s really interesting to see the whole process. I wouldn’t mind a little spoiler from time to time… well, I think i’ll wait for the whole thing! 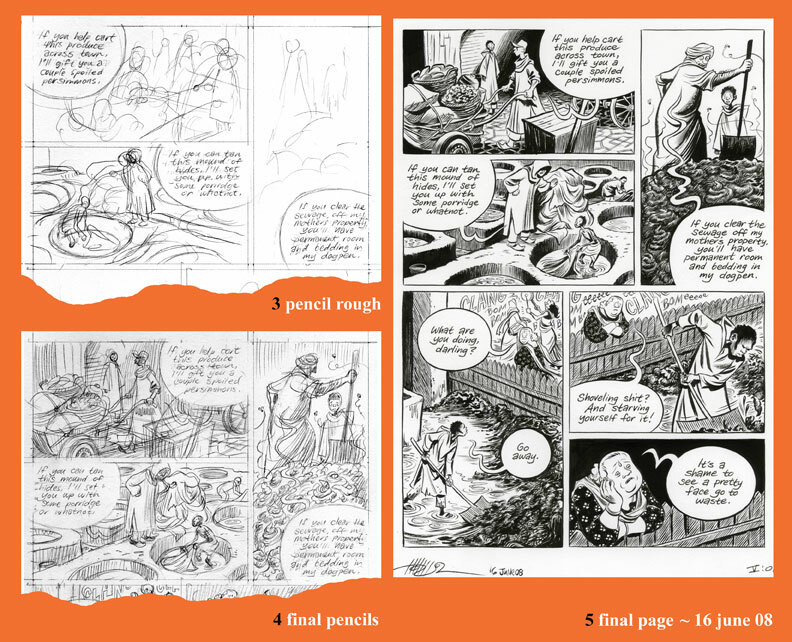 I see your final pencils are really a tight approximation to the final artwork (in other samples you have posted here before even more clearly.) You make most decisions, then, in the final pencil stage. It’s always rad to see how artists go about their production process. I’m working on my own book right now and it’s a lot of fun to see how everyone else tries to do it. I’m on the thumbnail stages of my work currently. Oops, sorry for the short “hello” comment, I have butterfingers. Just wanted to say how amazing Habibi is looking. I love your work, keep it up! hello craig, greetings from Italy! i’m studying illustration and Blankets changed my life! you are a costant ispiration for me so thank you. Habibi will be amazing. i can truly say that you’re my hero. P.S. would you post a photo of the real Raina? i’m so curious to see her!! I ate it. I read it in just one day. It’s awesome. Keep on truckin’, man. I do get that alot of people love seeing spoilers of habibi, but i want my eyes to be non tainted with assumptions about what the book will be like before it is actually out there in full. is there any possibility that you could say that it is habibi spoiler in the title? i have an rss feed on your blog and i love reading all you other stuff, i wouldn’t miss out on any of that. Thanks A LOT for this post Craig. It is really inspiring to see how you go through your steps from the very beginning untill it ends up turned into gorgeous pieces of work. 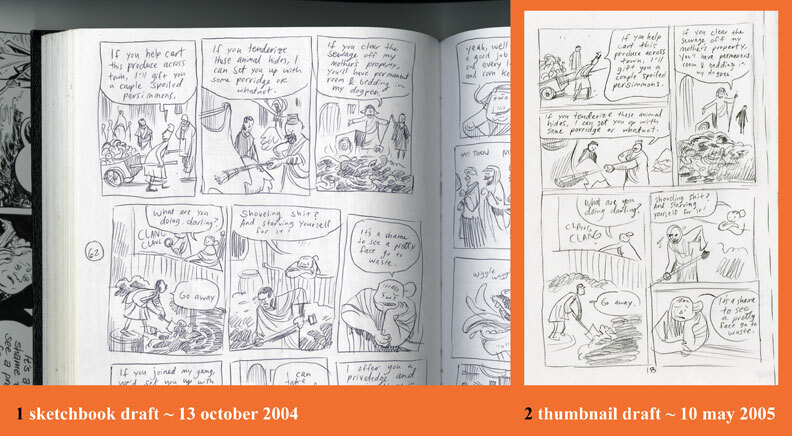 IÂ´m working on two graphic novels at the moment, simultaneously, and IÂ´m learning a lot from the process, and for that being possible, your blog is a place to go to find answers and best of all, to find inspiration, wich is what I find the most here. All the best and keep up the wonderful work! hi Craig – thanks for posting those wonderful drawings. I always wondered how you manage to create such gorgeous comic book panels. Mind boggling! Have just read Carnet de Voyage and enjoyed it as much, if not more than Blankets. Your work is truly special – I would be happy to one day have even half your talent! Simply sublime and inspiring work Craig. So masterfully done. I can’t wait to read it when it’s finished. Your work has been a complete inspiration to me as an artist, and if Habibi is anything like Blankets, and Good Bye Chunky rice, take the time you need to make it everything you’d like it to be! I appreciate that you have a blog, and dig being able to check out what you’ve been working on. And thanks for laboring to make such fantastic and inpiring work! Makes me sad I moved to Portland after Stumptown. I loved Blankets, Carnet, and really dug the Comics Journal interview- seeing your process and hearing you talk about constructing a long-form narrative was really rewarding for me. You’ve inspired me to try to refine by brush skills after several years of nib-only inking. Anyway, thanks for the amazing work and all the inspiration. Any consideration of putting out a pretty girls/tree sketchbook?